In Rhode Island when you throw away something into the trash it will mostly end up in the Johnston Landfill. To facilitate the disposal of waste there is a government system that works around the clock– involving desk jobs and manual labor, hard hats and conveyor belts, satellite-informed software and diesel trucks. The system is designed to ensure that trashed items end up in their designated location, and are processed accordingly. However, there is no component, no job, no machine responsible to ensure that whatever that enters the waste- stream is actually trash. Each of the 2,400 students at the Rhode Island School of Design is expected to spend $2,781 on art supplies per year. And until 2004, most of unused, unwanted art supplies was thrown away during annual move out, when RISD students leave Providence for the summer. In 2004, two RISD students started a program collect these art supplies and redistribute back to students. Doing do would help students with cost, while also being more economical and environmentally sound. Most preferred by the Environmental Protection agency this waste-stream intervention program is referred to as reuse, or upcycling. The two students who started this program at RISD called it 2ndLife. Since 2011 I have managed RISD 2ndLife from a shipping container beside the RISD Store along the Providence canal. Over the past few years, we have seen our supply and demand increase among students, local artists, and members of the greater Providence community. So we began coming up with new ways of dealing with this new flux. We began dreaming of a storefront. 2ndLife as a greater reuse program not only meant more free art supplies, it meant more comprehensive services. Through the Maharam STEAM grant, I began developing a model for progressive waste management between the City of Providence and RISD. Both would mutually benefit from the reuse of art materials. By diverting these durable goods from the waste-stream the school and the city save money in labor, waste production, and landfill fees while reducing our carbon footprint and ensuring that art supplies are used to their potential. In late April I shared this proposal with Sheila Dormody, the newly appointed Sustainability Coordinator for the City of Providence, who then agreed to act as my advisor over the summer. After our first official meeting we were both excited. The potential of this city-university collaboration, given its creative and industrious efforts, would help make Providence, “one of the Greenest cities in the nation,” a hope voiced by Mayor Angel Taveras. Both Mrs. Dormody and I recognized that in order for 2ndLife to really impact waste-stream programs in Providence– and possibly nationwide– it needed to be self-sustaining and effective in its collection and distribution of art materials. 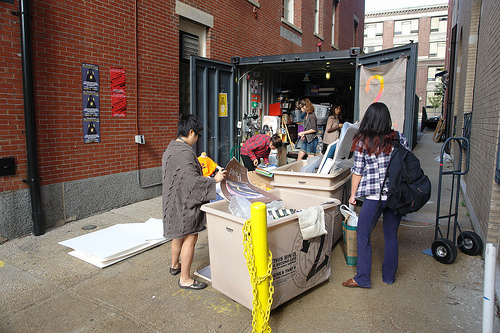 In late May, RISD Facilities and the Office of Residence Life sponsored a three day twenty-four student-led effort to collect unwanted items from residents moving out from the dorms during annual move out. We at 2ndLife realized that all the work were doing for college material upcycling was new, unique, and, in a way, pioneering. I thought it worthwhile to write a manual which was pragmatic and well-researched, so I asked Mrs. Dormody to connected me to Sustainability Coordinators in New York City and Boston so that I could learn from them. The funds for annual moveout also allowed us to produce a “How To” for university students which explained how organize a materials collection drive and how to start a reuse center on their own campus. Cal and Phil, two other 2ndLife members, joined me on the trip to NYC for a meeting with Emily Rubenstien, Coordinator or Long-Term Planning and Sustainability, and Benjamin Rose, Director of the Materials Exchange Development Program under the Department of Sanitation. 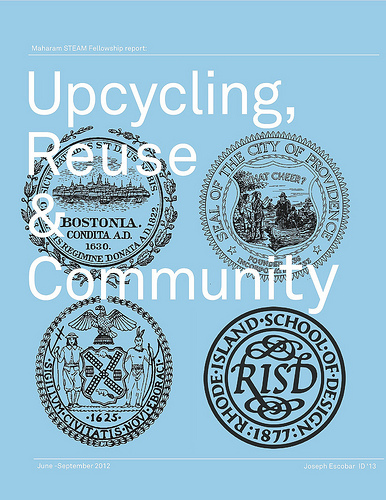 We all had an hour long conversation about the upcycling/reuse program in NYC where transportation and space are the two main issues when it comes to moving materials around the city. 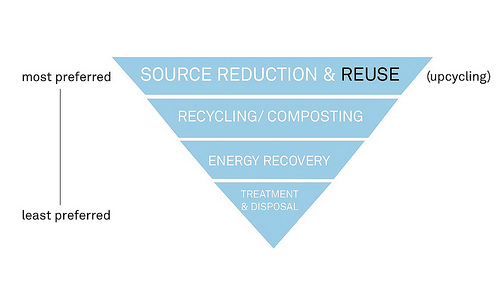 NYC has a mandate of 75% waste diversion by 2030; “So we had to explore reuse,” Mrs. Rubenstien told us. Ben recommended weighing and tracking the inventory since waste is often measured in tonnage and priced by pound. With this and other recommendations back in Providence we collected hard data for the some of the paper we collected in May. It seemed like we had a ton of it. RI Resource RecoveryValued between $0.02 and $0.50 per pound Bailed paper– just one of the paper types we collected– is processed by facilities like Rhode Island Resource Recovery Center who then ships it directly to the buyer, typically a Chinese or Indian manufacturer, who then processes the paper into another product. This is where 2ndLife comes in. On a mechanical, vintage Teledo scale acquired from a Fall River textile mill, we measured paper pads, one of our many products. These pads include Newsprint, Vellum, Bristol, Charcoal, Watercolor, and many more. Each was donated by students to 2ndLife during the 2012 annual move out. We collected 306 pads, weighing 433 lbs. At $2.54/pound these pads have an approximate value of $1,100. At 2nd Life we recently weighed some more of our inventory, (between 1/6 and 1/9) and it came out weighing 2,169 lbs. From there we estimated our entire stock to weigh roughly seven tons. 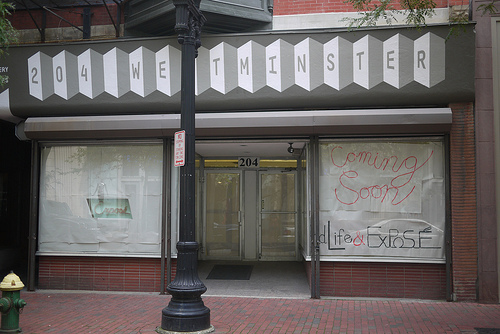 Later that summer– through the support of RISD and Don Morton, the director for the Center of Student Involvement– 2ndLife secured a storefront at 204 Westminster Street in downtown Providence. The space houses RISD 2ndLife and RISD Exposé, a student-run, student-curated gallery. In the new space, art supplies and art will be in the same place open to the public in an effort to connect RISD with the local community. Our grand opening will be on Saturday, September 15th in the evening.Over the past few weeks three local RISD alumni have dropped off no-longer needed art supplies, the Maharam Textile Company has shipped us two big box donations, and one Providence local, who passed away recently, donated some precious materials. Phyllis Weindberg was a great quilter. She acquired a large collection of textiles over her lifelong career. With her recent passing, Sharon McKain, a RISD faculty member and beloved friend of Phyllis, contacted me and asked if we would accept Phyllis’ collection of textiles. Mrs. McKain, with arrangements with RISD facilities, had 1,192 lbs worth of textiles and textiles supplies dropped off at the store front. The video above shows the intensive process it takes to organize textiles from our old space that overlooked the river along South Main. We took the the time to ensure all inventory is displayed properly so similar goods are placed together and the whole inventory is easy to navigate.Normally the conclusion would go here, however, I am compiling a document that describes in depth the meetings I had in NYC and Boston and, here in Rhode Island, and the developments of 2ndLife that are taking place as of the writing of this. I will print a few small editions. Those who would like to get a free copy can email me at jescobar@risd.edu. Check us out at the grand opening on September 15th at 204 Westminster. We hope to see you there. My first job as a designer/filmmaker in the development field is to consider my approach. During my time in Gulu, I saw firsthand the Western tendency to arrive with pre-conceived notions of the place and to develop quick or easy ‘solutions’ to problems based on Western knowledge. To be honest, there is really no set of knowledge that can be applied to development work as a one-size-fits-all solution. It is a very American notion to think of quick ideas that will ‘solve’ major problems, and understandably so. In the context of the American economy, an entrepreneurship approach makes a lot of sense. But everything is relative, and many of the issues that American entrepreneurship addresses are not as applicable to the problems of northern Uganda. The rapid prototyping model doesn’t bode too well in a place with such delicate political, economic, and cultural circumstances. Coming into the project, my collaborator, Jill, and I knew we wanted to use our combined skills (our studies in anthropology and film respectively) to tell the stories of Gulu and GWED-G (Gulu Women’s Economic Development and Globalization). We hoped to understand what an investment in media and storytelling could look like, integrated into the work of a non-governmental organization in northern Uganda. But we were determined to let the unique context drive our approach: we began exclusively by listening. Patience became our partner in the process. We learned to sit through silences and take as much time as needed for stories to be told, for the past to be explained. And the outcome was revelatory. We gained a complex picture of the people of northern Uganda, their history, their lives, their communities, and the impact of GWED-G’s programs. Today, we have a catalog of these stories, in addition to a longer film piece that will serve as a benchmark for what effect an organization like GWED-G can have on a community and how they do it. 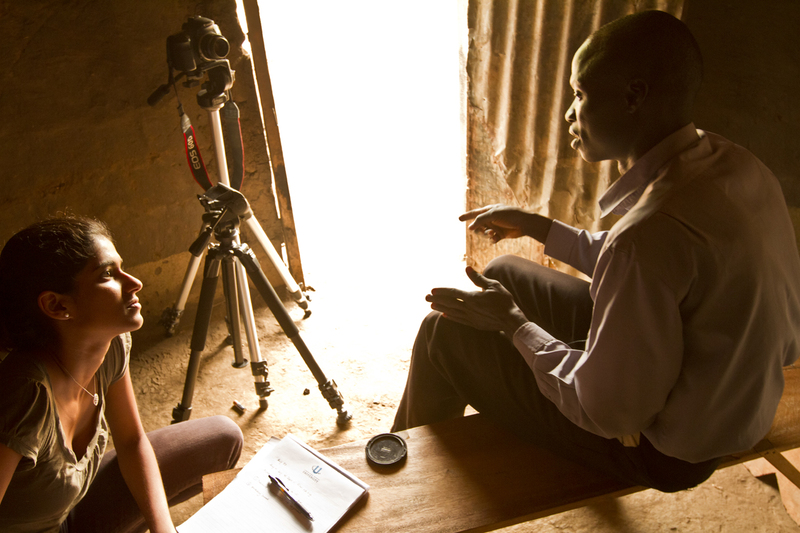 Through this media creation, we understood our role as tools for the people of northern Uganda to share their stories and for GWED-G to communicate its work. And our work is certainly not done. We have only scratched the surface of what can be learned through the stories of Gulu. Design is a process-based way of working. It unfolds in unexpected ways, takes itself in unique directions while revealing things about the task at hand. This is what development work is asking to be, and in order to answer that request, the designers and media-makers who decide to work in development need to make long-term commitments. We need to let our solutions take the same course as our evolutionary design process.